← Oscar Pistorius plays the discrimination card – we should all have guessed that was coming, shouldn’t we? The UK Police ‘underfunded’ and ‘under resourced’ – what the heck has happened here? Who in their right mind would join the Police Force in this Country in this day and age? Only an idiot, maybe? Is the job of law enforcement in Britain any longer one desirable to get into in this twenty-first century? Perhaps, perhaps not? In the really old days there were a few men (no women, eh?) who tramped the streets and tried to protect the public, but it wasn’t until over some two hundred-and-fifty years ago that we saw in London the origins of the modern Police and Police Stations – in the form of the Bow Street Runners (the nicknamed ‘peelers’ or bobbies’, no less), set-up by then Home Secretary ‘Robert’ Peel – such things came under some opposition in those times, it is said. Since those early tentative beginnings, there have been of course a multitude of developments and changes that have created a UK wide national police service, albeit organised mostly on a territorial basis (some forty-five forces now). The Government’s wide ranging austerity measures though over the past six years have brought the Police themselves under the cosh (an assault weapon favoured by violent criminals), through swinging budget cuts that has decimated forces and facilities far and wide (some thirty-thousand officers and staff have been chopped since 2008 – too few officers meaning excessive overtime payments required, including someone getting a whopping £55grand), so whatever claims are made about maintaining ‘frontline services’, this has meant that our Police can no longer do the same job as previously, doesn’t it? This all at a time of the need for increased security and potential extremists’ attacks, as well? But what does this all mean for those ‘thinking’ of making a career in the service? What will their prospects be, eh? Not what they were, that is for sure, will they? 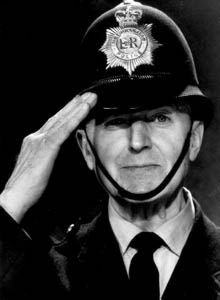 In recent decades the attraction of the Police as a worthwhile, sought-after, job has taken a severe dent and has steadily depreciated, as the role model image of ‘Dixon of Dock Green’ (BBC TV series running over a decade in the mid 1950s) has faded badly, hasn’t it? Policing in Britain has always been of a bit of a physically dangerously risky profession, but that has got progressively worse in the modern age, with a population being increasingly ungodly and violent (and often as they say ‘tooled-up’ to boot) and criminal into the bargain, including guns, drug dealing and a substantial influx of aggressive criminal gangs from abroad as well.. There are nowadays about four million criminal offences actually recorded each year and many others not so recorded. Widespread problems occur though because normally ‘ordinary’ people are increasingly caught-up and coming into conflict with the police through such issues as committing motoring offences (dangerous driving, drink driving, careless driving, speeding, no tax, no insurance, failure to stop after a minor accident, mobile phone use, traffic lights compliance, motorway lapses, driving in bus lane, obstructive or prohibited parking, and the like), or escalating offences cause by excessive drinking (fights & street violence, domestic violence, criminal damage, and other even more serious issues. Unfairly, a lot of the previous respect from the general public that the Police used to enjoy, say fifty years ago, has somehow gradually evaporated (possibly following the loss of the local ‘beat-bobbies’?). There is also a very large community of course that hates the Police with a vengeance – the criminal classes, don’t you know? In this day and age, the Police Force is no longer about macho men patrolling the streets with wooden truncheons and silver whistles looking for troublemakers, is it? No, it is all about a highly controlled, anti-crime, talented body of multiracial, male & female, diversely skilled, organization involving frontline officers, backroom support, technical experts, scientists, etc and reluctantly increasingly numbers of armed personnel. So apart from a career as a general Police Officer (perhaps with a specialist role – like say a armed response unit, detective, trained high speed car driver, protection officer, traffic police, dog handler), there is a wide range of other roles as a Scene of Crime investigator, or Fingerprint officer, or Intelligence expert, or Crime analyst, or Forensics investigator, or Communications staff member, or Command and dispatch worker, or Prosecution preparation officer, or Detention officer, or HR member, or Lawyer. So quite a few career operational roles are around these day to be involved in our law enforcement, if not as a traditional uniformed serving police officer, aren’t there? The job for a police man or woman in Britain basically requires the skills of caring people looking to uphold the law in help of their community, gaining its respect, and not some kind of Rambo character. There can be no doubt that it remains a highly challenging role carrying substantial responsibility within a large dedicated team operation. Anyone who has watched TV of operational Police action, will have seen that these guys on the frontline have to have the ability to unruffled handle a crisis or emergency, the judgement of Solomon, the calmness of a samurai, the patience of Job, the tact of a diplomat, as well as the athletic ability to chase after fleet of foot criminals desperate to get away and escape justice. So quite easy really then? But what about the rewards, are they any good? Well, they used to be – with generous pay and perks making Police Officers in the top twenty of earners, but not any longer, eh? No, after years of austerity freezes, the Police are not well paid well for what they do and it doesn’t start off healthily these days, does it? Nop, the Tories have made controversial reforms involving (amongst other adverse things) ill-conceived (?) cuts that now see new recruits’ starting salary lower than a McDonald’s trainee manager! Hardly the way to attract men and women of the right caliber into a sometimes dangerous demanding job, is it? Supposedly, we are strangely told, that is the way to reform the Police within a programme of modernisation, eh? Everyone who wants to become a police officer has to complete a probationary period ‘on the beat’, so to speak. Many officers may prefer to spend the majority of their careers in some form on patrol – but others of course opt to transfer to more specialist work. Notwithstanding that above, nobody should head for that profession without serious thought about the strain, stresses, risks, and abuse that goes with the job nowadays – for you, does that all get outweighed by the excitement, achievement, self satisfaction, and reduced financial rewards, eh? This entry was posted in AUSTERITY, communications, community, criminal, criminals, economy, establishment, government, police, political parties, Politics, Uncategorized and tagged Bow Street Runners, Dixon of Dock Green, excessive drinking, motoring offences, Police Force, police officer, Robert’ Peel, Tories. Bookmark the permalink.